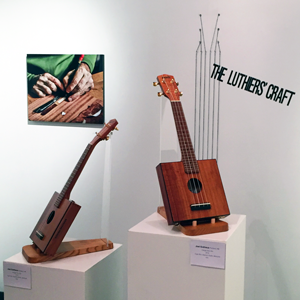 The Center for Maine Craft Gallery presents The Luthiers’ Craft, an exhibition of Maine-made stringed instruments October 9-November 18. The exhibition is presented as part of the Second Annual Maine Luthiers Exhibition and Music Showcase and curated by David Holbrook, who is also participating in the exhibition as a violin maker. Exhibiting luthier artists include Joel Eckhaus, David Holbrook,Dennis Patkus, Ron Pinkham, James Macdonald and Nathan Richardson. Originally from Philadelphia, Exhibition curator David Holbrook received a BFA from Tyler School of Art and has been living in Liberty, Maine for 25 years. In addition to his luthier work building violins and repairing stringed instruments, Holbrook is a custom woodworker and an art handler/installer for the Maine Arts Commission and others around the State. The violin he is featuring in the exhibition was made by hand using traditional hand tools and is made primarily from woods harvested in Maine. His violins are inspired by and modeled after the work of old Italian makers such as Stradivari and Guarneri. Ron Pinkham/Woodsound Studio of Rockport, ME is a builder of Concert Classical and Steel Strung Guitars, and a repairer/restorer of all orchestral and fretted stringed instruments and their bows. Nathan Richardson of Portland, ME apprenticed for 18 months at Fretted Instrument Workshop in Amherst, MA, followed by a year cabinet making, and five years rebuilding grand pianos.From 2007 to 2017 he handled guitar repairs for clients and retailers across New England, including Yale School of Music students, and lectured on lutherie with the Connecticut Guitar Society from 2014 to 2016. His recent work has included developing new construction methods, bracing patterns, bridges, and bodies. He recently completed a forthcoming book exploring the language of the guitar titled Learning to Speak Guitarist: a Luthier’s Thesaurus. Samples from the book can be read at learningtospeakguitarist.com. Richardson is currently available for instrument consultation and design services. Joel Eckhaus/Earnest Instruments of Portland, ME has operated EARNEST Uncommon Musical Instruments off and on for the past 40 years. He builds acoustic and electric mandolins, tenor guitars and ukuleles, and does repairs, restorations, and custom instruments for players and collectors. His customer list includes Eddie Vedder, Stephin Merritt, Neko Case, Elliott Sharpe, Will Patton, and Barry Mitterhoff. He studied the ukulele and tenor banjo with Roy Smeck, Vaudeville’s “Wizard of the Strings”. Joel’s also a performing musician, musical saw maestro, ukulele teacher, and has written a couple of mysterious true-life luthier stories for the Fretboard Journal. Eckhaus has taught woodworking and instrument making at Maine College of Art, Haystack, Penland, and mentored several aspiring young luthiers. His instruments have been shown at the Museum of Making Music, Carlsbad, CA, the San Francisco Folk Art Museum, Stamford Museum, CT, and the Colby Museum of Art. James Macdonald is a custom woodworker, marquetry artist and maker of handcrafted electric guitars featuring his hand cut marquetry art. He has created designs for the Gibson Custom Shop when they ran a Visual Artist program. His Eat A Peach Tribute Guitar is in the collection of the Allman Brothers Museum at the Big House in Macon, GA.
Dennis Patkus/Patkus Guitars of Fairfield, ME is an acoustic guitarmaker and all stringed instrument restorer with a shop in Waterville, ME. Harlow Gallery of Hallowell, ME will present a concurrent exhibition October 12-14. In addition to exhibitions in the Center for Maine Craft Gallery and Harlow Gallery, the City of Hallowell will present a music festival October 12-14 during Maine Craft Weekend. The festival celebrates Maine’s stringed instrument makers and performers and features a weekend-long schedule of live music, craft talks, instrument raffles, and keynote speaker Ned Steinberger of Nobleboro, ME – a recognized innovator and leader in stringed instrument design and manufacture.